Of all the launches at this September’s Cannes Boat Show, it might just be this motor cat from Canada’s Oxygene Yachts that most sets tongues wagging on the pontoons. 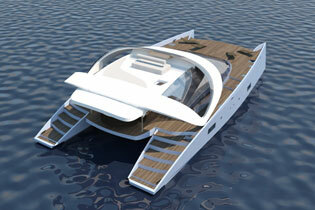 It’s called the Air 77, and takes the current trend for open, free-flowing spaces on boats to the absolute extreme. The 77ft cat features a massive 280 square metres of living space, with owners able to climb the gently sloping transom steps up into the 65 square metre saloon and straight out through a huge hydraulic door onto the foredeck. Unusually for a cat of this size, the master cabin won’t be using the full beam forward. 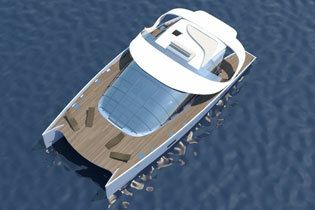 Instead, Oxygene Yachts has squeezed six cabins in the first boat – four for owners and guests and two for crew. 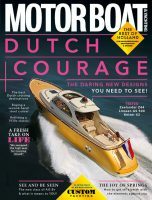 Power will come from twin 260hp diesels driving water-jets, which will push this big cat up to an intentionally modest top speed of 20 knots to keep fuel consumption and emissions down. Being on jets, the Air 77 should be able to squeeze into bays normally out of reach of shaftdrive boats, and the low draught should provide nimble manoeuvrability in tight marinas.